Gotland Game Awards 2010 is currently in its final stages of planning, this year we promise you a grand gala, far superior to any previous year. 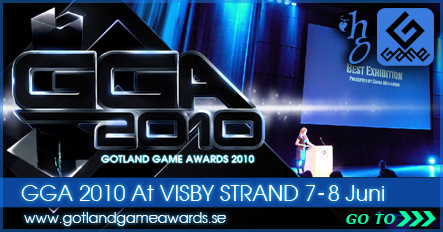 To get more information regarding Gotland Game Awards 2010 visit our new webpage. Gotland Game Awards is an annual event and as such a new page will be constructed each year in order to keep you, the public, up to date. If you’re here to see what earlier iterations of Gotland Game Awards had to offer please go ahead and browse the page, if that is not the case click here to go to Gotland Game Awards 2009. In the photo above you can see the happy and skilful winners of GGA. Fairytale, GameRider, In Other Words, Physitive, Planetaria and Vertigo as well as the teachers chosen to lead this legion of mischievous youths. GGA is over for this year and we hope to see as many, or actually, even more great projects next year! Because of the quality of the projects shown this year at GGA, it was however decided that more than just one project from HGO, was to be given the honour of going to Leipzig, Germany and have a chance to show of their winning games at GCDC, the biggest Game Conference in the world. Although everyone in the picture looks incredibly happy, the days at GCDC were not just filled with playtime, instead most of the time was spent guarding our booths and handing out business cards to people from all places imaginable. This is not to say that there was no time for fun and games, everywhere you looked you saw new and, even newer games! While getting to show off the games we had all made to a total of 250 thousand people was the grandest award a gamedesign student could imagine, being allowed to walk around and try games such as World of Warcraft: Wrath of The Lich King and Starcraft II was a reward in itself. For me and I believe everyone else who were allowed to go to the GCDC it was one of the most memorable things which has happened so far in life, and for everyone not allowed to go, as well as new students, this should work as a source of inspiration to make even greater games next year! To all students, good luck again next year and to anyone interested in knowing more about GGA, please go to the About page. For even more info on how to become a sponsor, the webpage or any other questions not answered on the About page, please go to the Contact page and send us a mail. The Gotland Game Awards web page is still under construction, please bare with any technical or formatting error you may stumble upon. We try to update the page daily with new content and fixes so make sure you bookmark us so that you can visit us frequently. 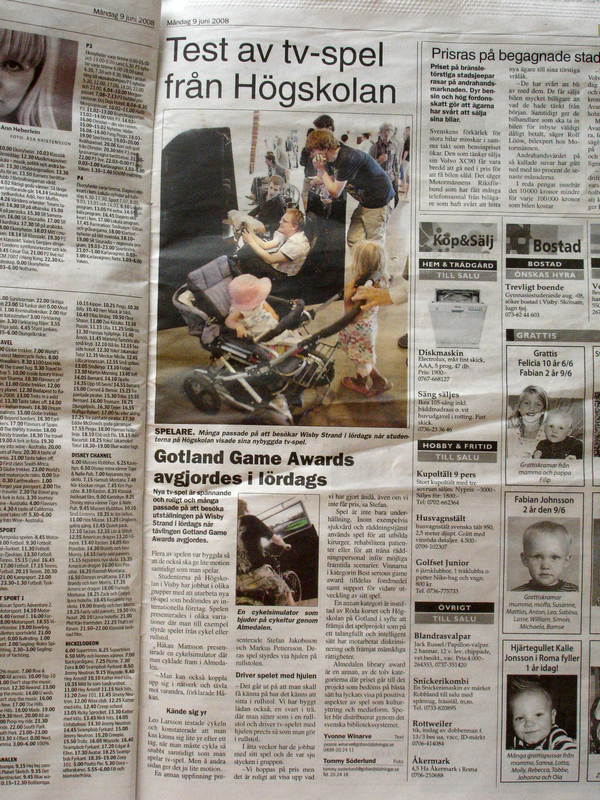 Gotland Game Awards occupying multiple pages in Gotland’s biggest newspapers. During the 6:th and 7:th of June it was decided which 13 project who was the best. See who won on the Winners Page! Gotland’s University will during a few days in July be visited by some of the biggest international names within the game industry. 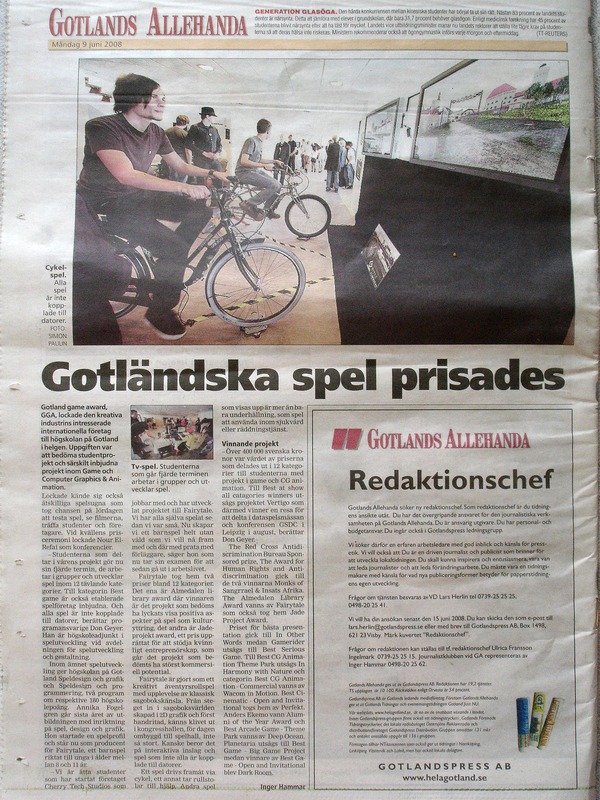 The reason is Gotland Game Awards, which this year is being held for the 2 time. They will during this time period play games (and watch CG movies) designed and produced by students at Gotland’s University. Nour El-Refai as seen on TV during the Swedish Eurovision Song Contest qualification rounds will be presenting the 13 awards. Young and old, happy or glad, you’re all very welcome to test the games, watch the movies and attend the award ceremony at Wisby Strand on the 7:th of June! PopArt | Design: NET-TEC Artikel of Matratzen. Coding: Verbraucher of Brautkleid.